And she's not the first Vita Coco drinker to find large mold chunks. This is Barbara Kline, a mother of two and coconut water enthusiast from Goshen, New York. "It’s all I drink, coconut water," Kline told BuzzFeed News. "Well, not anymore." That's because Kline became violently ill after finding "an octopus-looking thing" in her Vita Coco coconut water on April 25, she told BuzzFeed News. "When I took a big gulp, I swallowed a chunk of something," she said. "It tasted very thick and syrupy. It was disgusting." She checked to see if she'd accidentally bought a flavor. When she saw it was, indeed, the unflavored variety, she dumped it out and saw "it was a whole different color." "After I opened it up, I heard things jiggling inside," she said. "And I thought, 'That doesn’t sound right.' I took a knife and opened it up and that’s when I discovered those octopus-looking things." Kline said she immediately vomited. A spokesperson for Vita Coco said the company believes the object is mold and thinks it is "highly unlikely" to pose a health risk. "Vita Coco is a preservative-free beverage made from naturally-occurring ingredients. While the consumer has yet to return the product for testing, this looks like typical food spoilage," said Arthur Gallego, Vita Coco's global director of corporate communications. 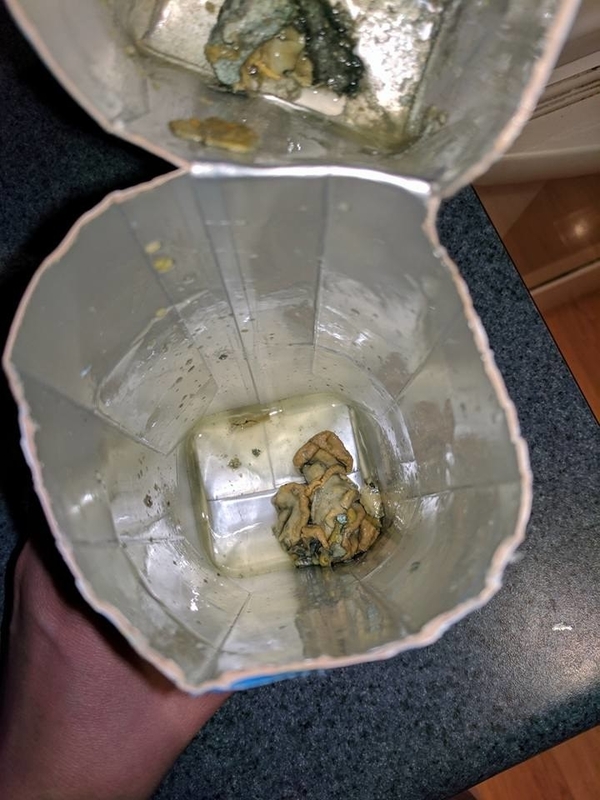 "This consumer's product was likely left opened, improperly refrigerated, or damaged, and after reviewing the images she has posted, we are confident it is mold growth," he added. According to the company's website, Vita Coco is shelf-stable for up to a year and must be refrigerated and consumed within 24 to 48 hours after opening. Kline said she'd bought the coconut water at her local grocery store less than a week earlier and had followed the company's guidelines for refrigeration. 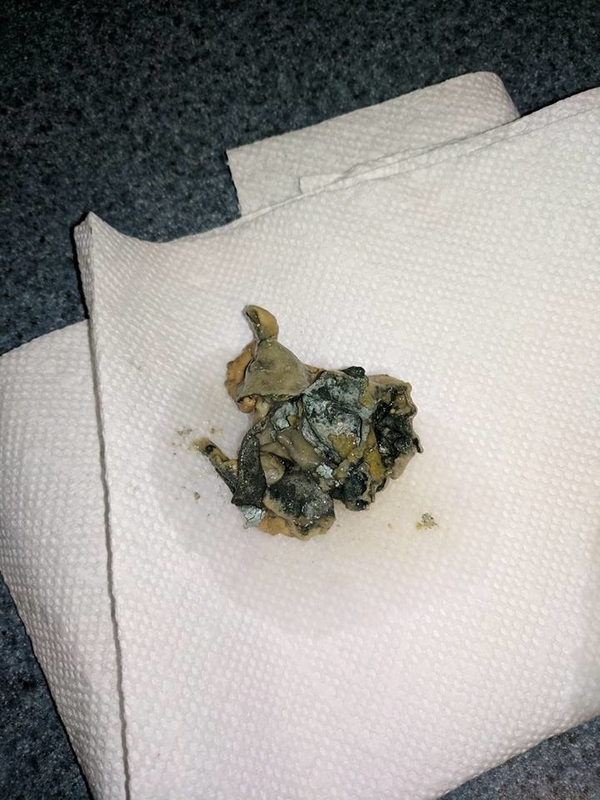 She said she even "heard the click" when opening it, indicating that it was sealed. "When I open my Vita Coco, I don't let it sit more than a day and a half in the fridge," she said. Kline told BuzzFeed News that she's "highly, deadly allergic to mold" and has experienced vomiting, diarrhea, and an asthma attack since consuming the coconut water. "I haven’t had an [asthma] attack in like 10 years. Now, all of a sudden I have one?" she said. "God knows if it’s from the mold." Kline did go to her doctor, but all tests came back negative, she added. She has also asked the FDA to take the mold in for testing. However, the FDA told her they typically collect only "unopened or intact products for laboratory analysis." Vita Coco has asked to take the mold in for testing, even sending her a container to send it back in, but she does not plan to hand it over. "Why would I have them pick it up, when they’re going to sit there and say, ‘Oh, it’s nothing!’" she said. "I’m not stupid. I’m not going to hand over the only evidence I have." Particularly because now, Kline is planning on suing the company, she told BuzzFeed News. "I’m not into suing people at all," she said. "But now, I’m not getting any closure, I’m not getting anything. So yes, now I’m going to take further action." And she cares a lot more about getting answers than getting a settlement, she added. "Money is nothing to me right now. My health is more important to me," she said. "I’m in it for clarification and to know if I just inhaled or drank something that’s deadly. "All I want is an answer. I want clarification that I’m OK."
Kline isn't the only person who has found what appears to be significant mold growth inside Vita Coco containers. Multiple people have posted photos and videos of their discoveries online since at least 2011. No thank u to a side of #mold in my new @VitaCoco! Ugh could not be more grossed out. Check your bottles people!